How to Password Protect a Document in Google Drive. IMP: If you are looking to use google drive as a secure option in your android phone, a better option would be "Sec Notes". It support text notes, spreadsheets as well as checklists with all possible formatting options. Password, pin and pattern locks are available for security in the app. With Google Docs merged to Google Drive, a lot of us have cultivated the habit of storing any and every document into Google Drive. After all, its safe, secure and maintained by Google in the cloud. And like a lot of people I also have a spreadsheet containing some little private info which I need to access now and then. Something like a bank account number, login ids, social security number etc which I can look-up using the Google Drive app on my phone. There is a small problem here. Although Google Drive can only be accessed after logging into Google, we are almost always logged into Google in our phones and PCs. That means if somebody gets access to your PC or phone momentarily, he/she can actually take a peek at these... not too good!!! The best solution to this problem would be to have Google Drive ask for a password each time you open a document. Unfortunately, Google doesn't provide such a protection feature in-built. 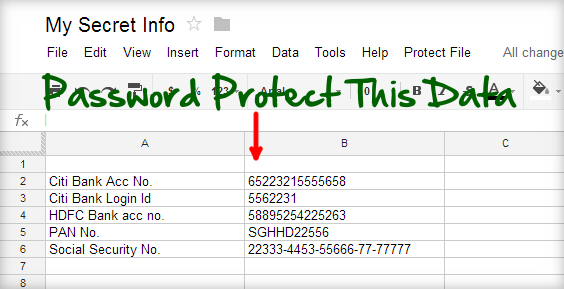 But you can achieve the same using the password protected Google Spreadsheet which uses Google Scripts. Here's how to use it. Open and make a copy of ProtectedSheet Google spreadsheet. You can rename it to any name you want. Next select "Tools->Script Editor". This will bring up a script in a new window or tab. In this window, select "File->Manage Versions" and click on "Save a new version". You can leave all fields blank. A new row for version 1 will appear. Just click "OK" button. 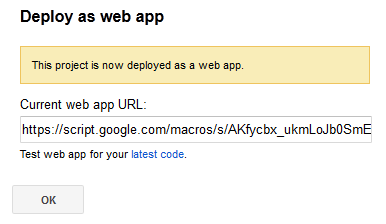 Now select "Publish->Deploy as webapp" and click on the "Deploy" button. You will now be shown a confirmation that you app has been deployed as a web app. Now close this window and come back to the spreadsheet tab or window. You will find a new menu item "Protect File" in the spreadsheet. Select "Protect File->Initialize" and provide required permissions. All the above steps are one time only. You have now fully setup your password protected document. Now you can add what ever you want to store securely into the document. Just make sure you leave the first two colored rows intact. To secure the document, select "Protect File -> Encrypt File". You will be asked to enter a password. Once done, this will scramble the content each cell in the document. Now your data is fully password protected and nobody can read it without having the password you have set. NOTE: This password is not your Google account password, but any password you can choose. The first time you run "encrypt", you will be asked to set a password which will be used for all further encrypt/decrypt requests. When ever you want to decrypt your document, open it and select "Protect File -> Decrypt File". You will be again asked for the password giving which it will decrypt and bring back the cell contents which you can read or edit. This works well if you are opening the spreadsheet in a PC. But if you are opening it from a phone, Google always loads the phone version and you won't get the "Protect File" menu. To encode/decode your spreadsheet from a phone, click on the encrypt/decrypt URL which will be present in the first row. This URL gets created and added once you deploy the web app in step 4 above. 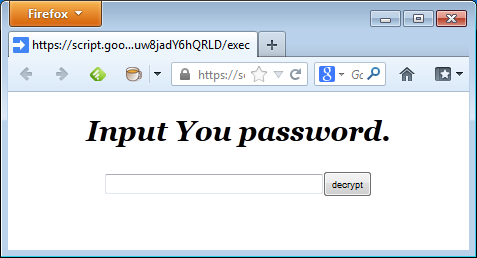 On loading the URL will show a web page where you can enter your password to encrypt or decrypt the document. Once done, a "Go back" link will appear which you can click to load the encrypted/decrypted spreadsheet. You can also change the password anytime using "Protect File -> Change Password" menu option. Please make sure you don't edit and change the encrypted document. If you do so, the decryption won't be able to give back the original content. And as always, the script is your local copy and runs entirely in your Google account. Nobody else has access to anything including the password you set. On clicking the encrypt menu, the script checks the password with what you have set. Only if it matches, the contents of the Spreadsheet is read and text in each cell is obfuscated. On clicking Decrypt, the same algorithm converts the obfuscated text back to the original text if the password matches. Finally, here's a video to see Google document password protection in action. Could something similar be done to password protect a google drive folder? Can I be assured that the script does not send you my password? Oh and by the way, this password need not be your Google password and has no relation to it. Can you explain better what the script is doing? I was trying this and i got an error after i insert the password for decrypt. Hey, thanks. I was thinking more on technical stuff. How do you store the password? is it possible that this fails and i cannot restore it? Another question: Can i use this with shared documents? I think this is really a great tool to have. Do you know if it would be possible to do the following? : When a specific google doc opens, clear the content, prompt for a password (in-line or as a message box), and if the password is correct show the content? I guess it would be possible on spreadsheet but can't figure if in a google doc there would be a way. Also, can't people see the previous contents when they see the revision history (both on docs and spreadsheet)? Thanks a lot! Hi Gary, the encryption is a simple text obfuscating algorithm. The script is fully open source and you can see the code by going to "Tools->Script editor". Great! If I need to remove the first two colored rows to use as title? Unfortunately this does work as all the plain-text content can readily be accessed from revision history! Hello, congrats for your solution, it is very ingenious! I work in a spanish research center and we have been working for a long time on SafeGDocs, a Firefox add-on that encrypts Google Drive documents. We tried to extend our development to protect spreadsheets but it resulted a complex problem, so we decided to focus in protecting documents for now. If you want to try our solution, you can download it for free through our web page: http://www.safegdocs.com. Any kind of comments or suggestions are welcomed! Is it possible to auto encrypt the document once the sheet was closed? Tried this script but didn't work for me. When I share it and someone else tries to open it, the browser gives the following error: Server not found Firefox can't find the server at ced177de-427b-4c06-be38-e302655140b1.foo.bar. It is fairly easy to get around the encryption by just looking at the revision history of the spreadsheet. Well done, but it's slow. In example: if you have 100 records, you will have to wait ~5 mins, right? From my point of view, it will be faster to use encrypted files located on WebDav folder, but (of course) your solution looks very delicate. Thanks. Surely it would be nice to encrypt one row, that contains passwords. By adding feature that could decrypt only one cell would be lot faster. In addition, password could be shown for 10 seconds and then encrypted again, which will raise security level of this thing. Does this script work for any item stored in Google Drive, or only Spreadsheets? This is very nice work and a step in the right direction, nice work Arun however you should be careful to not mislead people into thinking this is secure. This is trivial to bypass or "decrypt" unfortunately. Perhaps some way to use real encryption and to lose the revision history would to be publishing this web/app as a web service. You bind a single sheet to remember the salt and a pointer to where the doc is currently (have to delete after every decrypt to remove revision history). You then pass all the cells through your personal web service you've deployed via google apps or the like. This solution has issues but would be a good deal more secure. I followed the steps in this article but nothing happens. I took a protected sheet from an existing google drive workbook, copied it into a new workbook. When I copied it over the sheet was no longer protected. Is that where I am getting stuck? I'm working on a MAC if that makes a difference. Any help would be most appreciated! Helo Arun, when I click on the link to run the script from my smartphone, it doesnt show me the dialog to input my password, but it appears a google screen that says "Lo sentimos, el archivo que has solicitado no existe. Comprueba la dirección e inténtalo de nuevo" In english it woud say the following "We are sorry, the file you have just reached does not exist. Check the address and try it again". So, when I click the link from my smartphone it doesnt work, but it does when I use a browser from a PC, just as you have shown in your video. This works great. Ive been using it for almost a year! I REALLY wish that Encrypt meant scramble and Decrypt meant normal english, like the true definitions of the words indicate. Perhaps you could make a change for future downloaders? My bad- you already fixed this. You're brilliant! This is awesome, thanks for posting this, how strong is the encryption? This really needs to be the ONLY comment. This is highly insecure, and this article should have a big disclaimer on it. TROUBLE!!! Suddenly the system will only decrypt 1/2 of the document. In addition, Mr. Arun has been totally unreachable via direct email or email through his site. The good news is that no one can read my protected document. The bad news is that includes me. I've tried to go to past revisions but guess what? They're all encrypted! Also, the link no longer works. Grrrr. yep, but you can swap out the encryption algorithm with an AES one (see below). my only concern here is how your password gets stored. storing your password seems to defeat the purpose here. the AES code found here https://code.google.com/p/slow... ports directly into googlescript code. all you have to do is copy the files separately into your script editor. // initialization vector, make this unique and RANDOM and DO NOT SHARE!! the current encryption method is very weak. type webaddresses and its easy to see where the "www"s are and the ".com/net/org"s. also, cells with equations don't seem to get encrypted, so the code needs to be modified to handle that properly. Overall a nice write up and a good way to get started on encryption in gdocs! BLAH!! Somehow the decrypted text got re-encrypted and now my document has no real text, its just encrypted. Its almost like it got saved while it was encrypted. HELP?? I noticed an issue if a cell begins with a capitalized 'D'. The encrypt functionality turns it into = and then throws an error in the spreadsheet. Any ideas on how to get around this without putting a single quotation to start the cell? This works great on my computer, but it's not working on my android phone. It always gets stuck once I've input my password. I don't ever get the "Go Back" button. I have lost all the data I have stored. I mean all my details are encrypted after I tried to decrypt my information. I have been using this spreadsheet from past one year. Now I lost all my important information. I don't have backup too. Please help me. Could somebody help me out? I had everything encrypted. However, when I opened up the spreadsheet, I did not see the usual "Protect the File" tab and then I tried using the url to decrypt which did not work. Lastly I went to the script editor and deleted the script in hopes everything would revert back to the original spreadsheet. I made it worst. Is there a solution for this issue? Thanks! Google Drive is great for collaboration, but it lacks some basic file sharing features, like password protection. I use ioroad.com for my file transfers with non-google users. Yes, I also encountered this problem this morning. it appears Google has shut off ScriptDB, on which this script relies. Clarification: Google hasn't completely shut off ScriptDB, but scripts can no longer can write to it. Consequently, you can't change or set up a new password. It also hangs if you try to encrypt or decrypt a sheet you've already set up. The reason is that it tries (but fails) to update a flag in the database indicating whether the sheet is in an encrypted or decrypted state. I am unable to decrypt my information lately. It was working fine for a couple of months and now it wont decrypt. HELP! I've written a guide to restoring your ability to decrypt and encrypt existing sheets here: https://docs.google.com/docume.... Let me know if it works or doesn't work for you. I cannot utilize the mobile access. I am prompted for the password, but there is not successful decode or "Go Back" window on my mobile device. I have tested on my pc and gotten the same results. Anyone else? STEAR CLEAR OF THIS!!! I had been using this for 6 months and it worked great. BUT then it suddenly glitched during a decrypt and my information still looked encrypted. I said decrypt again and it got worse. I did it a third time and again it did nothing but glitch further. I don't ever think I'll recover the information on this document. Oh and the comment below is a good reason to stay the f away. Even I have same issue with encrypted spreadsheet. Please pass on the information if you find the solution. Your explanation seems logical, and would really be a lifesaver. However, after following your instructions, I'm getting the same error. I guess I'm asking if you can double-check it. If your new script is taking Google's ScriptDB out of the equation, I shouldn't still be getting: "ReferenceError: "ScriptDB is not defined", right? It worked up until today, when Google must have further crippled ScriptDB. The error message is new for me. I'm going to take a look at it next week. About a month ago, Google disabled writing to the ScriptDB, which the original script used to store and retrieve the user password and track whether the sheet was encrypted. It appears Google has now completely shut off access to ScriptDB, so any script that references ScriptDB (even read-only) will fail. The good news is that you can still encrypt and decrypt your sheets if you know the password. The bad news is that, to do so, you'll have to remove all references to ScriptDB in the script to make it work. Moreover, the password protection was never really secure. As others have mentioned, you can go to the change history in the document to access unencrypted snapshots of the database. Also, the script never based the encryption and decryption on the password itself; it uses a hardcoded key to do the encryption and decryption. So it was always possible to modify the script to bypass the password check in the code and have it decrypt the document. "This works well if you are opening the spreadsheet in a PC. But if you are opening it from a phone, Google always loads the phone version and you won't get the "Protect File" menu. To encode/decode your spreadsheet from a phone, click on the encrypt/decrypt URL which will be present in the first row. This URL gets created and added once you deploy the web app in step 4 above. On loading the URL will show a web page where you can enter your password to encrypt or decrypt the document. Once done, a "Go back" link will appear which you can click to load the encrypted/decrypted spreadsheet." Again, I get to the point of entering my password, but when I enter and click "decrypt" nothing happens.....I can't help but think I am overlooking something or the document is decrypted somewhere on the device that I am not seeing. You can also do some of the code yourself, it is limited but some html, ect can do the trick - backup your info- or you can even convert to word then share. correct syntax, enough tweaking it, Do as much as you can modify, you will get it. I already have one done been working on solving security issues for a client and am almost done. I started less than 4 hours ago. 1st time user of gdocs as of 4 hours ago. And I well on the way to having it secure and as snug in a bug in a rug. It all done dependes how you set it up. You do not have to it verbatim as he says, yet you can do it, play around. It does take some html syntax+tags you guys can get this done. Take your time-back your info up. keep as liitle on there as you need- keep trying to improve it. Play with file extensions, trial and error also there a few other sites you can find, that have a lot of handy info on how to code into gdocs. You also want to play around other ways with, take the factor of different os, the difference between a pc and a phone, common format,ect. do as much html or other acceptable scripting on your own, asmuch as it can take. I have been with it for only a few hours and it is going well. I am still experimenting, but like I said it all comes to basics. Do and mod as much as you can yourself, back your files to an external hdd, where it can't be lost, play around with the file extension. this is a good start, but not 100% satisfactory solution, still very faulty, bad command setup, seems to be orphaning a lot of path vectors and file corruption by constantly changing it back and back again. Also there are a lot of other sites that contain useful and good info, you can tweak your gdocs, to your like. But play with the code peoople, and till you have nailed it, and even after. If doing IT all these years has taught me anything, is if a problem may happen it always does, driver conflict sotware conflict, possible crash or fail, very generic code errors, take say error 10 for example, annoying yet fixable.... it will never fail to do that. As well as the endless loop that is, safe secure-gets cracked, made safe again, soon after cracked, and repeat.. back it up & keep as little on there as you need, share don't email. Also I am going to check the work offline mode and try it in a virtual machine you can rent for a very reasonable fee. keep tweaking it. and so on. When I figure out a secure way. I will placing it on a url. I mean i'm brand new with gdocs only been working at this for a client of mine for several hours, and I am making very good progress. Also I am considering AES-256, Good luck & happy birthmus! Firstly really like this. I was wondering what is the procedure when sharing the encrypted sheet with other people where they need to edit the document and then using the same encryption password encrypt it again. This did not work at all. No protect file menu item came up. How to Track and Find Your Lost or Stolen Windows 8 Phone.